Laguna Dam (1) is the oldest dam on the Colorado River (1907). Laguna Dam RV Park (2) - on the north side of this park, along the road leading up to the All American Canal, is a lady who feeds the birds (scatters seed on the ground and road). On December 20th and 22nd, Golden-crowned Sparrow seen. On the 22nd, a Summer Tanager was also observed. 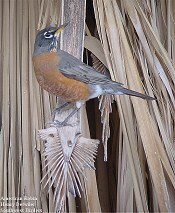 More common birds are Inca Doves, Gambel's Quail, and White-crowned Sparrows. Trader Horn - (3-4-5) old abandoned settlement with lots of remaining California Fan Palms. 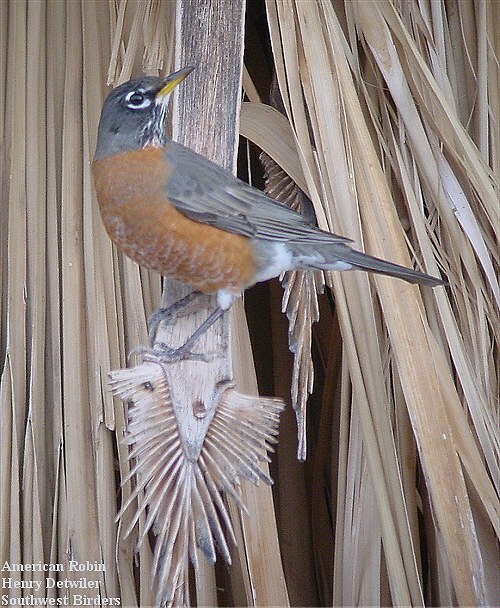 On December 21st and 22nd, two Rufous-backed Robins were seen multiple times. They have been seen as early at 9:30 and as late as 1:30. They weren't seen after that, despite long waits. The most obvious characteristic of this bird is the bright orange bill, and when flying away from you, the bright rufous back. The pair spend most of their time on the ground. - From I-8, take the 4th Ave exit and go north .5 mi. 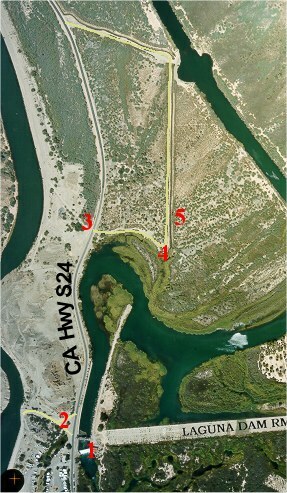 to the turn-off for California Highway S-24. - After 12.9 miles you'll be at Laguna Dam (1), the first dam built along the Colorado River in 1907. Across from it is the Laguna Dam RV Park (2). - Walk 100 yards north on the sandy track to a pair of fan palms (5) on the east side of the road. 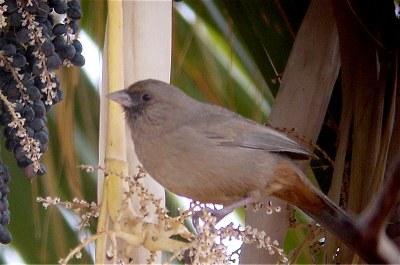 The first palm is used by the birds to feed in. The birds are also seen on the dead (burned) salt cedar just beyond the two palms. - .6 miles beyond this turn-off is the turn-off to Senator Wash and West Pond -- if you reach this turn off, go back .6 miles! 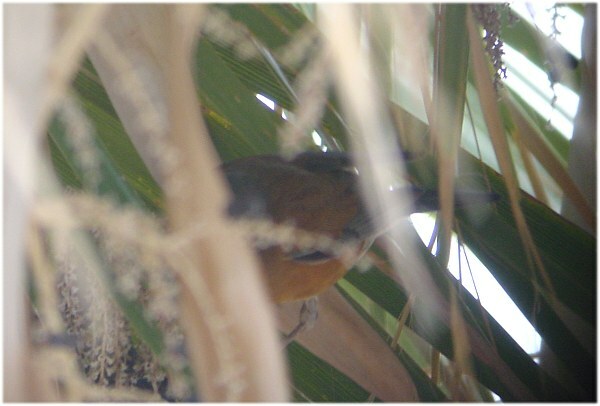 Lots of these birds are also feeding on the fan palm fruits, including the Gambel's Quail and Abert's Towhees!